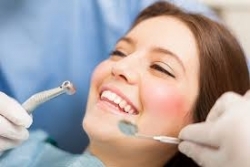 Dental Fillings prevent teeth from further decay. Reserve an appointment with a dentist to close off the gaps and spaces between teeth. The filling material depends on your dentist. Commonly used materials for fillings include porcelain, gold, a composite resin (tooth-colored fillings) and an amalgam (allow made of silver, copper, zinc and tin in some cases). The type of material used is directly associated with the cost of the fillings procedure. Copyright @ 2019 Pakistan Dentist. All rights reserved.